Environment and Health Ministerial Board in Vilnius, Lithuania on 1 July 2014.
contribute to the WHO Conference on Health and Climate (to be held in August 2014 in Geneva, Switzerland) and the twenty-first session of the Conference of the Parties to the United Nations Framework Convention on Climate Change (to be held in 2015 in Paris, France). Members of the EHMB consider that working with the European Union (EU) and its agencies is of high strategic importance to perform these tasks. In particular, they agreed to establish solid collaboration with the European Commission, the new European Parliament and the countries holding the EU presidency in 2015–2017. In addition, they laid out a plan of action to strengthen links between multilateral environmental agreements relevant to the implementation of the commitments made at the Fifth Ministerial Conference on Environment and Health, held in Parma, Italy in 2010. Plans for the Sixth Conference are being developed. 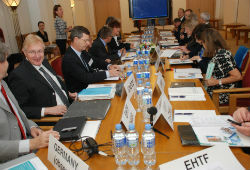 EHMB provided guidance in identifying the main themes – air pollution, climate change and chemicals – while the European Environment and Health Task Force (EHTF) will engage with all 53 countries in the WHO European Region to align priorities, develop targets and reach an agreement on the desired outcomes. A mid-term review will assess countries’ progress between the 2010 Conference in, and the next in 2016. At the meeting in Vilnius, four new members of the EHMB – the health ministers of Croatia, Georgia, Lithuania and Spain – assumed their seats, following their election by the WHO Regional Committee for Europe. Dr Vytenis Povilas Andriukaitis, Minister of Health of Lithuania, and Mr Amir Peretz, Minister of Environmental Protection of Israel, were elected co-chairs. Croatia and Ukraine each offered to host a meeting to support the European environment and health process in 2015 and 2016. EHMB’s sixth meeting will take place in February 2015 in Madrid, Spain.